Almost all subwoofers more or less look the same. What sets them apart is their sound performance – especially when it comes to reproducing bass. There are standout models, like the Polk Audio PSW10, that could satisfy an audiophile’s need for bass output impact. A subwoofer’s bass would improve a sound system’s audio performance. 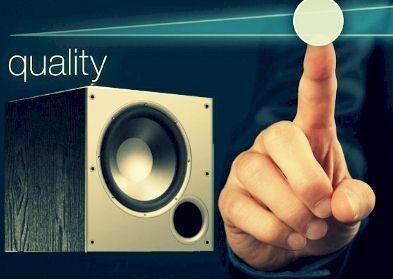 The experience of watching a movie or listening to music, using your sound system, could be taken to the next level with a good subwoofer. Sound effects in a movie would be clearer and more profound. The sound of drums and other percussion instruments will be more defined. Polk Audio is known for producing high-quality, affordable speakers with great audio quality and performance. With this Polk Audio PSW10 review, we will go into detail how this 10-inch subwoofer fares when it comes to sound quality, features, and connectivity. The overall appearance of the PSW10, with the standard cube box form, is the same as most subwoofers in the market. The Polk Audio PSW10 is more compact at just 14.4 inches high, 14 inches wide, and 16.1 inches deep. It weighs 26 pounds. It comes in two finishes to choose from: black oak vinyl and cherry-colored vinyl – striking finishes which will suit any modern home theater or sound system color scheme. The design of the PSW10 greatly contributes to make the product durable. The enclosure is made from non-resonant medium-density fiberboard (MDF board), with internal bracing. The quarter-inch thick baffle enclosure design has a titanium-finish front that matches the Monitor Series speakers. The Polk Audio PSW10 is equipped with a single 10-inch composite subwoofer with a built-in high-current amplifier, 50 watts continuous power, and 100 watts dynamic power. It also includes a polymer-composite cone driver. One great thing about PSW10 is that it is compatible with most home theater and electronic systems. It works especially well with other Polk speakers. This subwoofer has RCA line level inputs, stereo speaker level inputs, and outputs that allow easy connection to any system. However, PSW10 does not have a direct LFE input for the 80Hz-to-160Hz crossover control. The PSW10 works well and straightforward with most existing systems. Surely, connectivity and system compatibility will not be a problem. Polk Audio offers an extended warranty for the PSW10. Five years warranty is given for the subwoofer and three years for the electronics. The Polk Audio PSW10 is designed and engineered to provide superb sound quality and performance. The materials used for the driver, speaker geometry, and enclosure design contribute to the overall effect to the sound produced. This unique configuration of this subwoofer creates cleaner and clearer sound, eliminating distortion in low-frequency sounds. The internal bracing in the PSW10 help reducing internal standing waves. The dynamic balance driver materials in the PSW10 are resonance-free. With this, superior system blending provides low-frequency sounds that are deep and musical while sound effects are more thrilling. It also has a laser-based KlippelDistortion measurement technology, a technology which reduces sound distortion, provides deep and precise sound. Most Polk Audio speakers and subwoofers can be used to play extremely high volume levels without affecting the sound quality. The Polk Audio PSW10 is no exception. The audio performance of the Polk Audio PSW10 does not lack in its deep bass output and capabilities. PSW10 produces impressive bass impact. Percussion instruments could be heard with clarity and impressive accuracy. Bass is clear, crisp, and detailed without being too overpowering that it damages the overall sound quality.PSW10 will sound best in small to medium-sized rooms. The bass output of PSW10 will struggle in a large room. Should you need better bass quality for larger spaces, you might want to consider Polk Audio’s PSW12 or PSW505. The quality of sound is also affected by the 50-watt RMS amplifier equipped in the Polk Audio PSW10. The amplifier, together with the ten firing drivers, ensures an excellent bass impact even at low volume levels. The impressive 50-watt amplifier is designed for minimal power usage. Bass output and blending could be controlled through the low-pass crossover, phase switch, and volume controls found in the amplifier. More often than not, most subwoofers stop working due to the extreme levels of volume played. Fortunately, the Polk Audio PSW10 has a superior compression circuitry to limit distortion of sound when played at high volume levels. This circuitry reduces and prevents any possible damage that could result from loud and high volume levels. The Polk Audio PSW10 also has a useful smart sensing circuitry feature which enables the subwoofer to automatically turn on and off. This means that you would not have to worry about manually turning the subwoofer off should a power blackout, or an unanticipated needed shutdown happens. Consequently, it also automatically turns on once the power is stable. The automatic on and off feature protects the subwoofer from possible power surges. The Polk Audio PSW10 is highly efficient for its price. The quality of its audio output is quite impressive. The deep, detailed bass and the clear sound is quite a delight to listen to. It is perfect for small to moderately sized rooms. The design of the PSW10 contributes highly to its overall performance. The stereo speaker inputs and outputs are easily accessible. It is also easy to connect and highly compatible with most sound systems, especially for Polk Audio speakers. Also, the smart sensing circuit and superior sensing circuitry enhance the audio experience. Lastly, the extended warranty offered by Polk Audio ensures the buyers that their products give value for their money. The Polk Audio PSW10 is extremely easy to connect to most systems; however, it still lacks a direct LFE input connection to bypass the subwoofer’s crossover. Since the PSW10 is more compatible with other Polk Audio speakers, use of the PSW10 may not be maximized. Although the PSW10 has an impressive bass output, it will struggle to provide bass that is powerful and adequate for large rooms. PSW10 is suitable for use in smaller venues. To further provide an in-depth review of the Polk Audio PSW10, here is a guide comparing the PSW10 with similar products within its price range of under $100. The following subwoofers could serve as alternatives to the PSW10. Contender subwoofers include the Acoustic Audio CS-PS65-B, Dayton Audio SUB-800, and Theater Solutions SUB6F. The Acoustic Audio CS-PS65-B uses a high-current, 250-watt amplifier to provide full-bodied bass. It is quite smaller and lighter than PSW10. It is styled with an elegant black ash finish.It also has an MDF bass-reflex enclosure with internal bracing. Unlike the PSW10, the Acoustic Audio CS-PS65-B has an active compression circuitry which is helpful in spike and clipping protection. It has a frequency response of26Hz to 200Hz, in contrast with PSW10’s 80Hz to 160Hz. Efficiency of sound for Acoustic Audio CS-PS65-B is 96dB, while for PSW10 is 85dB. The Acoustic Audio CS-PS65-B is a great alternative to the PSW10 when it comes to sound quality and overall performance. However, Acoustic Audio CS-PS65-B is not as established in bass output as the PSW10 is. The Dayton Audio SUB-800 is one of the subwoofers under $100 that are great in value. It is heavy duty and highly durable than most budget subwoofers. While it lacks bass impact, it still provides a decent, neat bass using 80 watts of power. However, what it lacks in earth-shattering heavy bass it makes up for the overall offerings of this product. Very much like the PSW10, the SUB-800 is also easy to connect with other home sound systems. It also features an automatic on and off switch that detects whenever the subwoofer is in use or not. ​Lastly, Theater Solutions SUB6F has a distinctly deep and clean bass output that most low-end subwoofers lack. This front-firing subwoofer uses a powerful 200-watt power with a 50Hz to 150Hz frequency response. The full-bodied sound from the SUB6F could very well compete with that of PSW10. The amplifier equipped with the SUB6F can reach up to 24dB per octave. Its design also helps in reducing sound distortion. The above-mentioned subwoofers have identical features that would appear to buyers. 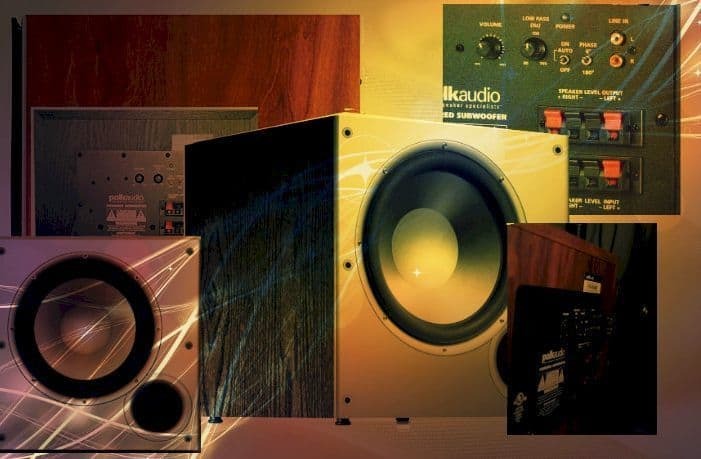 Choosing which subwoofer is best for you would depend on your particular needs – sound quality and performance, power efficiency, ease of connectivity, or value for money. Based on the specifications and overall sound quality, the Polk Audio PSW10 stands out amongst the subwoofers listed herein. Nevertheless, all these subwoofers are inexpensive solutions in adding depth on the audio performance of your home theater system. Polk Audio’s PSW10 is a bang for the buck type of subwoofers. It is a great addition to a home system if you are working on a budget. For its price range, the PSW10 offers excellent and quite impressive features – not to mention the clean and neat sounds. Thus, it gives great value for your money. It is a perfect upgrade to your home sound system as it is highly recommended for small to medium rooms. However, you might want to reconsider other subwoofer models if you’re looking to get one for larger venues. Enhance your movie watching experience and add depth to your music listening experience with the Polk Audio PSW10. Sound effects and bass have greater audio impact provide solid sounds. All of these thanks to the 50-watt RMS amp and 10-inch driver equipped in the PSW10. The enclosure is made from resonance-proof MDF, reinforced with internal racing, which delivers superior bass clarity.